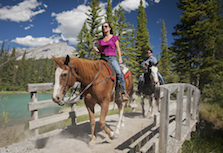 So, you love the idea of horseback riding in Banff but you have no horse-riding experience? Don’t sweat it. While getting in the saddle for the first time can be a little nerve wracking, it’s not as difficult as you might think. It won’t take you long to get the hang of it and by the end of thee day, you’ll start to relax and enjoy the ride. Here are some important tips from horseback riding experts to keep in mind for your first backcountry trip. “Be vocal when walking around horses, especially when approaching their backsides.” says Stan Walchuk, Jr., a writer for Canadian Horse Journal. “Horses that are dozing or feel threatened may kick out if startled. Never unexpectedly touch the backside of a horse that cannot see you.” Remember, a horse is a prey animal so when they feel threatened their instinct is to bolt. How should you approach a horse? Since the horse’s eyes are on either side of its head, you should walk towards it slightly from the side. Walk towards its left shoulder (that’s the side it is used to being approached from), making sure that the horse sees you. Speak calmly to reassure it, then hold your hands out to let it sniff your fingers. Then, reach out and gently stroke the horse on the shoulder. If you have a treat (such as a carrot or apple) to give to your new best friend, always hold your hand out flat to avoid getting your fingers nipped. “My best advice for any rider, on any horse, in any situation, is to breathe.” says blogger and equestrian Anna Blake. “When we are uncertain, our breathing becomes shallow and restricted, our body tenses, and that warns the horse to be nervous.” she explains. Taking a few deep breaths will help both you and the horse to relax. “Breathing softens our body and literally cues the horse than everything is okay,” says Anna. If they prick forward and focus in one direction, they might have spotted a deer or another type of animal further along the trail or in the trees. If their ears go flat back, it’s typically because the horse behind them is tailing too close or trying to pass them. If one ear is forward and one is back, most likely they are listening to you. For a more in-depth read on horse body language and what it means, check out this long and comprehensive guide from Equus Magazine. Tailgating isn’t just a dangerous practice when you are driving, it is also something you should avoid when riding a horse. When the horses get too close together they can annoy each other and this can possibly cause the horses to get spooked. Be extra careful when an obstruction on the trail forces horses close together. Before you embark on your ride, the guides at Banff Trail Riders will give you some instruction on how to control your horse and how to give it commands. Courtney explains that people enjoy horseback riding much more when they learn how to work with their horse and control it. Also, she adds that if your horse gets spooked it is important to know how to take charge of the situation. If you are ever unsure, just ask your Banff Trail Riders’ guide for assistance. And if you’re travelling into the backcountry on a backcountry horseback riding vacation, one of the best things you can do to save yourself from foot pain on your first ride is to start breaking in your cowboy boots early, says Nancy Brown, an Equestrian travel writer who reviews horseback riding vacations at WritingHorseback.com. Nancy also offers some wise advice for keeping the blood flowing to your feet and preventing strain. “After a few hours of riding, drop your stirrups (your wrangler will explain what I’m talking about in more detail, but this means taking your foot out of the stirrup) and do a few ankle rolls.” This will stimulate your circulation and keep your ankles supple, which is important on those long rides. Keep these tidbits of wise advice from horse experts in mind during your first ride in the backcountry. With these tips, you’ll be able to have a successful and safe journey and enjoy your experience so much more. Happy trails to you!